Every Fijian has an important role to play in nature’s restoration and protection, through sustainable management practices and valuing the important role our mangrove ecosystems especially provide. This year’s 2019 Earth Hour focused on biodiversity, connecting with communities in protecting their natural resources through sustainable environmental practices. 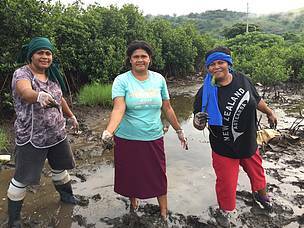 As a highlight and demonstrating local Fiji community actions, over 1,500 mangrove seedlings were planted by Tavua communities and individuals to strengthen the productivity of their coastal fisheries, local livelihoods and income and coastal protection against storm surges and flooding. Conservation practices are all about trying to leave the environment or ecosystem, in the same or a better state then when it was found. As conservationists, we are geared towards ensuring we leave something better for the next generation and in this case the state of our environment and the availability of natural resources. Unsustainable management and development practices have placed immense pressure on our natural resources leading to degradation and major loses to food supply, coastlines and riverbanks, which is and will be further worsened by the effects of Climate Change. For WWF Pacific, community, local and national partnerships are crucial to promoting and enabling environmental sustainability, which is the essence of this year’s Earth Hour theme of #Connect2Earth by restoring your personal connection to nature through community or individual actions. 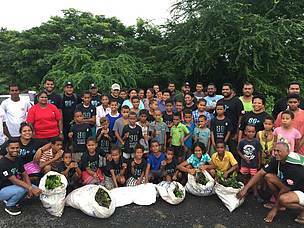 Korovou village in Tavua was the community that WWF Pacific engaged with to hold this year's Earth Hour. This is a first time; a community has hosted an Earth Hour activity and the activities will contribute to ensuring the protection of the village boundaries from high tide inundations and the restoration of the village’s mangrove areas that were damaged by Tropical Cyclone Winston. Currently, women would have to walk quite a distance to harvest crabs to earn a living and to also provide for the more than 700 people of Korovou. The challenge now lies with every Fijian to go beyond the hour by making the commitment to protecting the very lifeline that supports our community needs by supporting mangrove and native tree rehabilitation, proper disposal of waste and plastics, implementing green initiatives such as household composting and organic gardens, carbon footprint reduction through renewable energy sources such as solar lighting and switching off non-essential lights. Editorial is by Apolosa Robaigau, WWF Pacific’s Community Development Officer. Women of Korovou village that were part of this morning's mangrove planting. 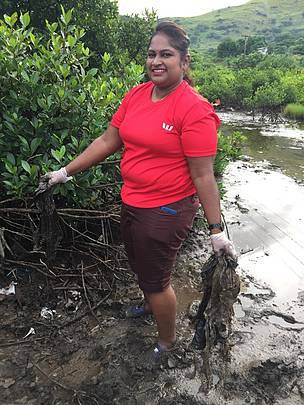 Westpac’s Tavua Branch Customer Service Representative, Sushil Naidu part of the waste collection team.